Andrew Russell, East and West Shaking Hands at Laying of the Last Rail. 1869. Albumen print, Courtesy Union Pacific Railroad. 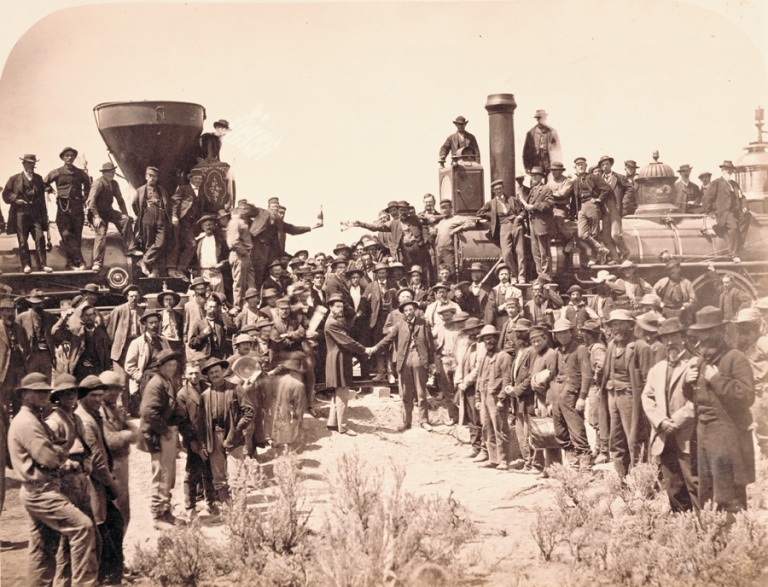 This exhibition celebrates the completion of the Transcontinental Railroad at Promontory Summit, Utah, on May 10, 1869, when the Central Pacific and its eastern counterpart, the Union Pacific, were joined by a golden spike. Two photographers, Andrew Joseph Russell for the Union Pacific and Alfred A. Hart for the Central Pacific, documented the railroad's challenging path through mountains and plains. Their original photographs and stereoviews, as well as archival materials relating to the Promontory Summit ceremony, will provide a new view into this transformative event, which allowed Sacramento — and E. B. Crocker — to prosper.